They range from musical miniatures, containing only two arias connected by recitative and accompanied by continuo (a bass line typically realized by cello and harpsichord), to larger works with named characters, a dramatic story, and rich instrumental forces. Telling more often than not about the pangs of love, these are intimate works, with texts frequently written by (and sometimes about) members of the privileged audience for which they were composed. A number of Handel’s cantatas have texts by one of his important Italian patrons, Cardinal Benedetto Pamphilj. Marco Vitale's project to record all of Handel’s cantatas is thrilling. The continuo cantatas have never been recorded in full and many have never been recorded at all. Thus, this project will bring to life largely unknown music by one of the world’s greatest composers - and the performance of all the cantatas will place the larger, instrumental works in the musical context of their creation. This project is the continuation of the ‘Handel Complete Cantatas’ series which appeared recently on the market with four volumes issued. This is the second volume presented by the Ayros recording label, as a continuation of the series. 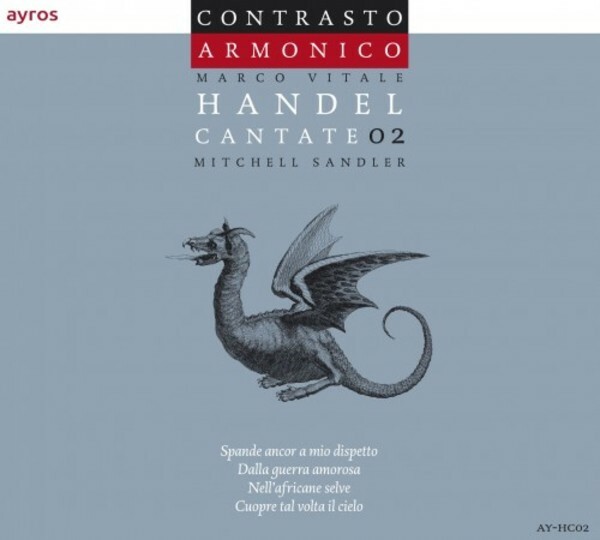 This CD features the bass-baritone Mitchell Sandler, who has worked on other Contrasto Armonico CD productions (Aci, Galatea e Polifeo & La Resurrezione). The CD also contain two trio sonatas by Arcangelo Corelli.